Thanks to ready-to-use refrigerated pie crust, this freestyle tart is a rustic and ridiculously easy way to please guests. Line 10-inch pie plate with pie crust. Carefully spread cream cheese into 6-inch circle on center of crust. Toss plums with granulated sugar and flour; place over cream cheese. 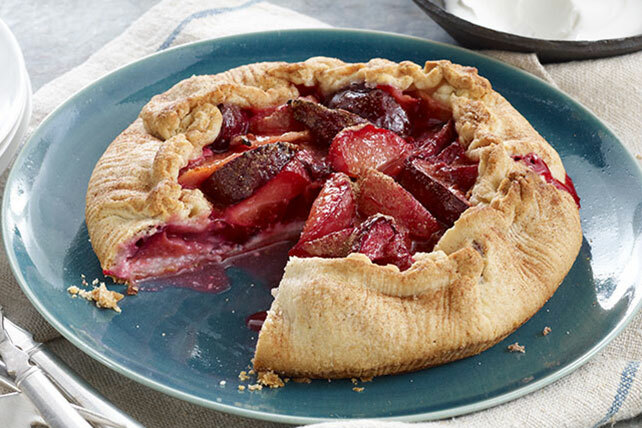 Gently fold edge of crust about 2 inches over plums, leaving center uncovered; sprinkle with cinnamon sugar. Bake 25 min. or until crust is golden brown and fruit juices are hot and bubbly. Cool slightly before removing tart from pie plate. Serve topped with COOL WHIP. Mix additional 1/2 tsp. cinnamon sugar with the COOL WHIP before using as directed. Substitute 2 cups of your favorite sliced fresh fruit, such as peaches, for the plums. Substitute 3/4 tsp. granulated sugar mixed with 1/4 tsp. ground cinnamon for the cinnamon sugar.